In Atlanta, Georgia, Thomas David “Tommy” Roe was born in 1942. At the age of 17, while he was still in high school, Roe was part of a trio with Bob West and Mike Clark called The Satins. Roe wrote a song called “Caveman” in 1959, backed with “I Got A Girl” and the trio was billed as Tommy Roe and The Satins released their first single on Judd Records. When he finished high school Tommy got work a soldering wires at a General Electric plant. In 1960 the single was re-issued on the Trumpet label. This time “I Got A Girl” climbed into the #10 spot on WAKE 1340 AM in Atlanta. The trio released a song in 1960 called “Sheila”, complete with Buddy Holly-esque vocal effects. But it failed to chart. Two years later Roe signed a contract with ABC-Paramount Records. Though he was just twenty years old, Roe found himself on the top of the national charts in America and Australia in October 1962 with a new version of “Sheila”. When “Sheila” became a hit, ABC-Paramount Records asked Tommy Roe to go on tour to promote the hit. Roe was hesitant to leave his steady paycheck at GE until ABC-Paramount changed his mind when they advanced him $5,000. With this success Roe quickly released a double-sided single, “Susie Darlin’” b/w “Piddle de Pat”. The A-side peaked at #13 and the B-side at #14 in Vancouver. A third single followed called “Town Crier”. for there’s a story that I’ve got to tell. and made a town crier out of me. I’ll tell the guys, don’t go there anymore. I’ll come home like Paul Revere. ‘Cause I’m a town crier, oh a town crier. and made a town crier, town crier, a town crier out of me. One of the co-writers of “Town Crier” was Howie Greenfield who co-wrote with Neil Sedaka, “Puppet Man” by the Fifth Dimension, “Breaking Up is Hard to Do”, “Calendar Girl”, “Happy Birthday Sweet Sixteen”, “Little Devil”, “Next Door to an Angel” and “Stairway to Heaven”. The later songs were all hits for Neil Sedaka in the early 60’s. Greenfield and Sedaka teamed up to compose “Where the Boys Are”, “Frankie” and “Stupid Cupid” both hits for Connie Francis. And Greenfield co-wrote another hit for Connie Francis called “Everybody’s Somebody’s Fool,” with Jerry Keller. The later a singer in his own right with a 1959 hit called “Here Comes Summer”. The pair also composed the theme tunes for TV shows Giget, Bewitched, They Flying Nun and Hazel. Greenfield would later write “Love Will Keep Us Together” by the Captain and Tennille. 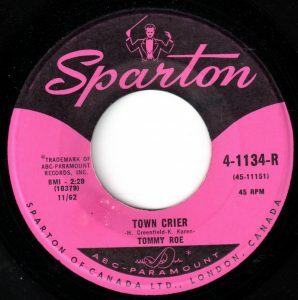 “Town Crier” was a song about a guy who goes through his town each night at midnight crying “hear ye, hear ye.” He does this to announce he is going to describe his plight to anyone who wants to hear how his girlfriend broke his heart in two when she found somebody new. “Town Crier” received airplay in only a few record markets in the USA. These were Erie, Pennsylvania where it peaked at #49; Hartford, Connecticut where it stalled at #55; And its best chart run in America in Seattle at #20. With this limited exposure the song never made the Billboard Hot 100. It did get some airplay in Australia and peaked at #82 on their national charts. According to Andrew Parker, writing for historyinanhour.com, the occurrence of a town crier dates back to medieval England. The general public was illiterate. In order for news about Royal Proclamations, market and festival events, passage of government bylaws and advertisements, a town crier was employed. “A gentleman, traditionally dressed (by 18th century standards) in a rather fetching red and gold robe, white breeches, black boots, with a distinctive tricorne hat, would bellow out to the crowds and ring a hand bell, drawing people’s attention. Town criers would shout the words “Oyez, Oyez, Oyez!” in the street before making their announcements. The word “Oyez” (which is the Anglo-Norman word for listen) is translated as “hear ye,” a cry for silence and attention amongst the masses. However, early 19th century records documented that town criers also called out “O Yes, O Yes!” Parker also adds that town criers often had to bring bad news to the local citizenry: news of a pestilence, famine, war, taxes etc. Consequently, town criers needed protection. This “was given via the ruling that the crier was working under the name of the ruling monarch and any harm sustained by a town crier was considered treason. This spawned the phrase “don’t shoot the messenger,” which was a royal command during that era. The BBC has reported more recently that shooting a town crier was seen as an act of treason, as the town crier was a messenger representing the king. In addition, town criers posted a notice on the doorpost of a local inn after having read the notice out loud in the streets. Consequently, when newspapers began and were deciding what to name themselves, many gave themselves names like the Washington Post and the New York Post. The tradition of the town crier is seen as a forerunner of our modern newspaper. While Los Angeles employed a town crier as recently as 1904, the position has passed into folklore recalling bygone times. Nonetheless, curiosity about olden days of the town crier has resulted in town crier competitions. Many occur in the United Kingdom. In 1963 Tommy Roe went on tour with and California Hispanic-American singer, Chris Montez, who had a #2 hit in September 1962 when he was 19 years old with “Let’s Dance”. Roe and Montez went on a 21-day tour in the UK in 1963. But they were upstaged by their opening act called The Beatles. Meanwhile, Roe had a #5 hit with “Kiss And Run” in Vancouver in August 1963. Tommy Roe, continued his chart success later that year with a #3 song called “Everybody”. Roe had a #4 hit in the UK in the fall of ’63 called “The Folk Singer”, which didn’t catch on back in North America, despite a folk music revival. To complicate matters, Tommy Roe’s focus on a recording and performing career was reduced for the remainder of 1963 until 1966 as he served as an electrician in the US Army Reserves. Having established a relationship with The Beatles from touring as a headliner in the UK in 1963, Tommy Roe opened for the Beatles in their first concert in the USA on February 11, 1964, in Washington, D.C. This was with the permission of the United States Army. In 1964, Tommy Roe’s only notable recording success was a #7 hit in Australia called “Party Girl”. (It also climbed to #3 in Atlanta). In 1965 his singles failed to chart. Things changed for him in 1966 when he enjoyed a return to the Top Ten internationally with two Bubblegum-prototype hits, “Hooray For Hazel” and “Sweet Pea”. After these to hit singles Roe again went through another two year drought of notable success until he had his biggest hit in 1969 called “Dizzy”. Between 1962 and 1970 Tommy Roe charted 15 songs into the Top 20 in Vancouver and six tunes into the Top 20 on the Billboard Hot 100. 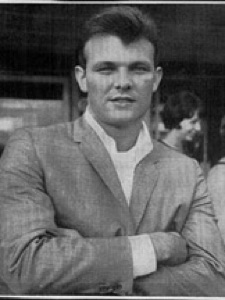 Tommy Roe has been inducted into the Georgia Music Hall of Fame and the Rockabilly Hall of Fame. In 2007 Roe went into self-imposed retirement. Although, in his memoir, From Cabbagetown to Tinseltown and Places In Between, he notes he was coaxed out of retirement to perform again in 2011. Since then, he’s performed on occasion. In August 2017, Tommy Roe gave a concert in Deadwood, South Dakota. Tommy Roe currently has no upcoming concert dates. Roe, Tommy. From Cabbagetown to Tinseltown and Places In Between. Michael Krikorian Publishing/CreateSpace Independent Publishing, North Charleston, South Carolina, 2016.